Wondering how reverse address lookup technology works? In this article, we break down what exactly is a reverse IP lookup, and share how you can use this to generate more leads for your company. Reverse address lookup might sound like a complex concept, but don’t worry – it’s actually pretty simple. You don’t need to be a coder, or have any sort of technical expertise to use reverse address lookup to your advantage. Before we answer the question of what is reverse address lookup, you’ll need to familiarize yourself with DNS. If that’s too confusing, don’t worry – just think of DNS as an address list of computers that are connected to the internet. Now, you already know that every device that’s connected to the Internet has a unique IP address that acts as their “identifier”. But because DNS translates domain names to IP addresses, we don’t need to go to all that hassle of memorizing lengthy IP addresses. Instead, we can simply type in Forbes.com into our address bar, and get redirected to the site! What is reverse DNS lookup? Now that you know what DNS is, let’s talk about reverse DNS. …they refer to the exact same thing. Now, with reverse address lookup, you’re basically looking up internet hosts with their IP addresses. The IP address you’re looking at has to have a valid Reverse DNS in order for this to work. As long as that’s the case, you can simply type in their IP address into your browser, and you’ll be redirected to their site. If they don’t have a reverse DNS record, though, you won’t be able to identify where your visitor is coming from. What has reverse DNS got to do with generating leads? Statistics show that, on average, a whopping 98% of website visitors will leave a site without converting. Some business owners and marketers will say that there’s nothing that you can do about that (short of installing an exit-intent pop up), but that’s not true. You can use reverse address lookup technology to capture your visitors’ information, and nurture them as a lead. We’ve previously discussed how you can use reverse address lookup to identify someone’s IP address and hostname. Most people aren’t actually using a unique IP address that they own. Instead, they’re using an IP address that their Internet Service Provider has temporarily allocated to them (while they’ve got them on contract). So you might be able to pinpoint your site visitor’s location using this address, but you won’t be able to tell who they are, exactly. Simple. Use a whois search to reveal more information about the IP address! For the uninitiated, whois is a system that allows users to look up the name and contact information of a registered website. When companies register a new domain name, they have to provide the registrar with their contact details. This is mandatory; it’s not a guideline – if you don’t provide accurate contact details, or you “willfully fail to replace out of date data”, your registrar can actually cancel your account and take back your domain. All domain registrars have to maintain the information of their registrants (known as WHOIS records), and publish technical records to an authoritative registry. 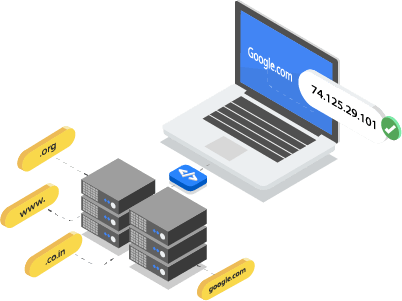 As long as you have your visitor’s IP address on hand, you’ll be able to figure out their domain name, their company, and their contact info! Reverse DNS can help generate leads in many different industries and can help with a number of different types of businesses. You could use it for everything from generating SaaS leads to automating your marketing for insurance leads. If you want to identify your site visitors, you don’t have to do a reverse address lookup and a whois search manually. We’ve built a tool that streamlines the entire process for you! This tool is called Albacross, and it’s 100% free to use. Step 1: Sign up for an account with Albacross. This takes just 30 seconds, and you don’t need to input any credit card information. Step 2: Copy and paste Albacross’s tracking script to your website. Step 3: Sit back and wait for Albacross to work its magic. Once we’ve collected enough data, we’ll start sending you daily, weekly, or monthly reports that contain information about who’s visiting your website, and how you can reach out to them. Apart from contact information, we even throw in data about each of your site visitors’ company revenue + the number of employees in their company. This helps you qualify your leads, and determine who’s a good fit! If you’re getting bombarded by too many leads, Albacross also comes with a handy filtering and tagging system. You can filter out leads from a particular city or region, or leads from a company that’s at least making $XYZ in annual revenue. Again, this helps you hone in on the leads who are most likely to convert! Now, while Albacross’s free plan gives you pretty much everything you need, we also have a premium plan which caters to businesses who want to sync up their lead information (that they get from Albacross!) to their own CRM. If you’re looking for a quick and easy way to generate more leads, you should definitely start using Albacross. Remember, with Albacross, you’re reaching out to people whom have previously visited your website. These folks have actually checked out your product or service, and they definitely have more purchase intent than the leads you get via Facebook ads or Google AdWords. What are you waiting for? Sign up for your free Albacross account now! You’ve got your lead information… what’s next? Once you’ve got your lead information, the next step is to reach out to them. Your lead might not be ready to buy right now, but that’s fine. The goal is to nurture them to the point where they’re ready to make a purchase. Now, what most sales reps struggle with is persistence. If you call your lead twice, thrice, or four times, and they don’t pick up, it’s easy to get discouraged, and want to move on to the next name on your list. Statistics show that it takes an average of 18 calls to actually connect with a buyer. So no matter what you do, don’t give up. Keep on calling and emailing your lead, so that you increase your chances of connecting with them. Of course, you should also work smart, not just work hard. Well, an analysis involving 2,200+ companies shows that sales reps who reached out to their leads within an hour were seven times more likely to have meaningful conversations with decision makers. You don’t have the luxury of waiting on those leads, and calling them only when it’s convenient for you. As soon as a new lead enters your pipeline, you should get in touch with them ASAP! Before we end off, let’s also talk about how you can optimize the emails you send to your leads. Also, keep your subject lines short and sweet. More specifically, subject lines containing just three to four words get more responses than longer ones. Finally, remember that your conversation with your lead should be a two-way street. You want to ask them questions, and demonstrate interest in their company as well. If you include one to three questions in your email, you’re actually increasing your chances of getting a reply by a whopping 50%. As marketers and business owners, we all want to generate more leads (preferably without incurring too much cost). If you’ve got the right technology on your side, it’s insanely easy to use reverse address lookup technology to capture leads from your website. Again, all you need to do is sign up for Albacross, set it up, and you’re all set. Once that’s done, you don’t need to lift a single finger, and you’ll get a regular inflow of leads that you can start to nurture. Here’s to generating more leads and scaling your revenue!